I love anything quirky that can’t simply be taken in, in just one glance and instead needs a second look to fully absorb it. Quirky shoes with heels that appear to defy gravity, original design and architecture that’s just that little bit out of the ordinary and fashion that makes people stop and stare – you name it, it appeals to me. I’d like to include hotels with a little cheeky personality and design into this bracket, like the Capri by Fraser Frankfurt Apartment-Hotel in Germany. Despite its demure demeanour of slate grey, possibly some would say slightly dull, apartment-block-ish feel from the outside, once you step through the doors the hotel’s vivacious personality begins to peak through with its modern interiors, playful names and unique design touches throughout. Capri by Fraser is a chain of hotels that pride themselves in offering the luxurious comfort of a smart four-star hotel combined with all the comfort and convenience of a home-away-from-home in the form of guest apartments. 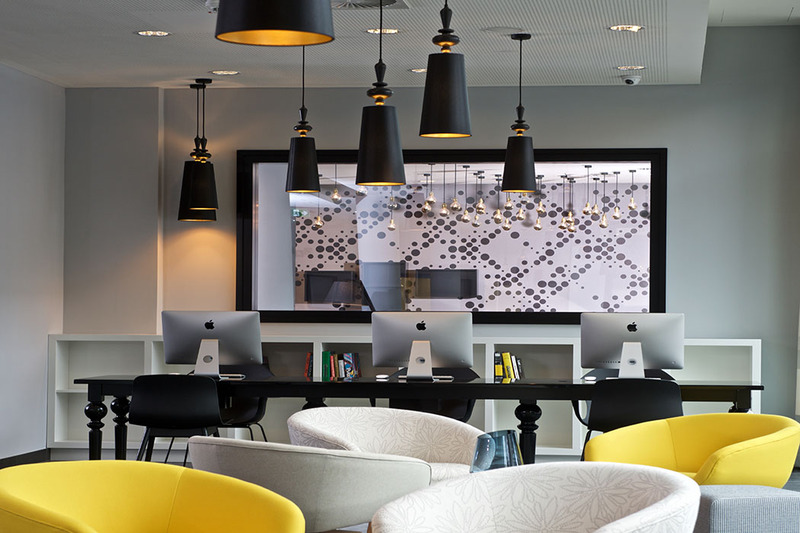 Each of their hotels has been designed differently but they all feature inspiring design and innovative technology. Capri by Fraser Frankfurt is conveniently located right in the heart of Frankfurt, close to the CBD, transportation system, Messe exhibition centre and it lies just a short walk from the Skyline Plaza shopping mall with over 180 shops and restaurants – what more could you ask for from a city centre hotel? The hotel has over 150 Studios and One-Bedroom Apartments with crisp, clean lines and quirky little design details to add a touch of character – like the buckle belts around the stools in the bedrooms, to the more unusual artwork hanging on the walls and the pops of gold and lively citrus shades that brighten the monochrome colour schemes in each room. The Studio Apartments which sleep up to 2 guests have integrated living, working, kitchenette and bedroom areas and range in size from 32 – 47 sqm. The One-Bedroom Apartments, which sleep up to 4 guests, are fully furnished with separate living, kitchen and bedroom areas and range in size from 40 – 47 sqm. 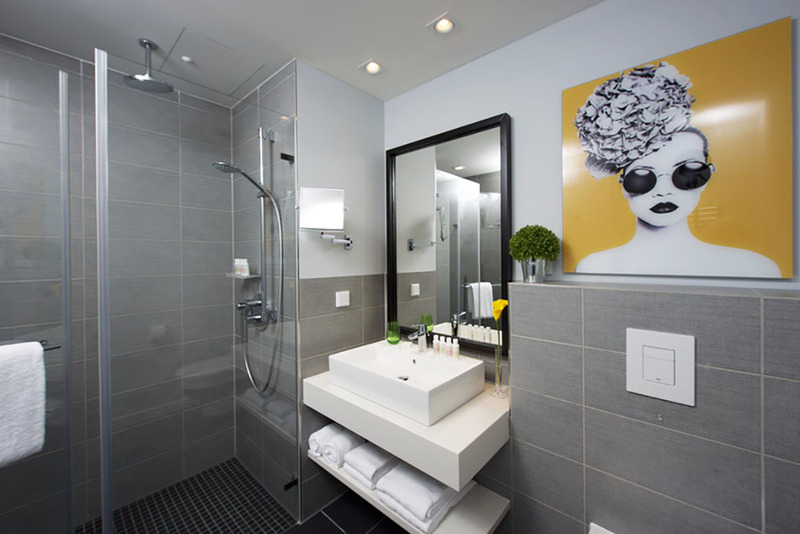 All apartments feature a king-size bed, media hub with iPod dock, LED TV, free wifi, air conditioning, safe, rain shower, bathrobe, slippers, hairdryer and Malin+Goetz toiletries. In addition to the mini apartments, Capri by Fraser Frankfurt appreciates the modern-day hectic lifestyles we lead and therefore operates as many of its services as it can 24-hours-a-day, including the fully-equipped gym, reception and a rather unique launderette with interactive games called ‘Spin & Play’. 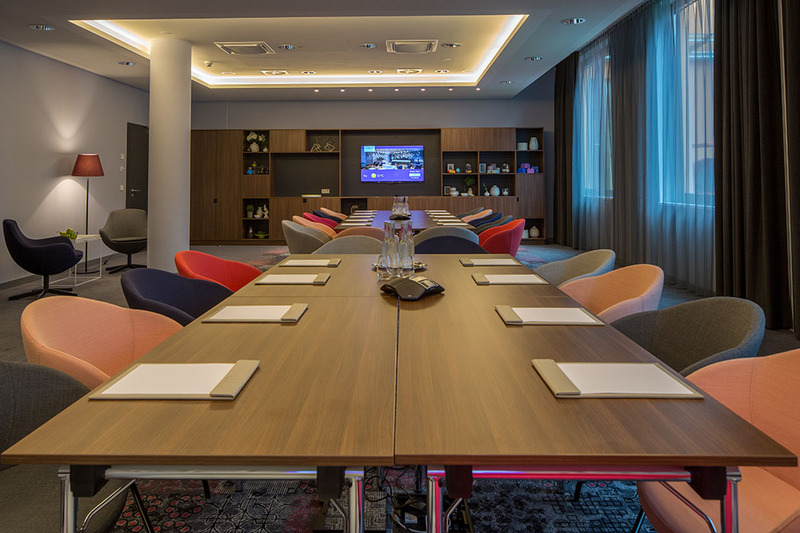 In addition to these 24/7 facilities, the hotel also offers a restaurant, deli and bar; business centre; meeting and conference facilities; concierge; and an underground car park. Outside the hotel you are in close proximity to everything you need including chemists, coffee shops, supermarkets, restaurants, banks and shops all just a short stroll away. Although not open 24/7, the hotel features an almost-open-all-day (6.30am – 10pm) restaurant called Caprilicious, which officially launches on 25th November and offers buffet dining and international a la carte, Western and Asian dishes. If you fancy grabbing something on the go, or a lighter bite then the Delite deli should meet your needs with a range of coffees, wraps, salads and more substantial meals (open 7am – 10pm).Finally, the hotel also has its own cocktail bar called Drinx, serving a range of creative drinks, beers and wines as well as a bar menu of snacks. Whether you are in Frankfurt for business or pleasure, Capri by Fraser Frankfurt will offer you the luxury of a four-star hotel with all the modern day conveniences of home.